Epiclore describes their music as "Symphonic Epic Atmospheric Metal." Epiclore is from Finland, and judging from the photos on their website, they appear to be quite a young band. The guys from Epiclore asked us if we'd listen to their 8 track demo (7 tracks + 1 bonus track). As a fan of this genre, I gladly obliged. In all honesty, this release is a lot better than I expected. Grace Upon The Realm is a very worthwhile demo, and I can understand why the guys are promoting this demo quite vigorously. As we all know, there is no shortage of existing and upcoming power / symphonic metal bands, but I do think Epiclore has a shot to elevate itself above the pack. Naturally, a band of this genre has its obvious influences. In the case of Epiclore, Rhapsody and Nocturnal Rites come to mind very easily. Having said that, it is important to note that Epiclore has a sound that brings together elements from influential bands into a fresh new sound that works for these guys. It does not sound like they have simply done a copy-paste from the aforementioned bands. The musicianship is quite mature and skilled for such a young band. With the exception of an instrumental track and another track that clocks in at 4:44, the remaining songs are no shorter than five minutes. The songs are interesting enough to keep your attention from the first note to the last. All too often, I hear songs that just drag on and on, but Epiclore have the ability to swoop 5-10 minute songs out of their pocket without falling into this category. The double kick drumming is present throughout much of the album, keeping the speed dialed up to "high" for the majority of the time. The thoughtfully placed symphonic elements give this album an undeniable "epic" feeling and are an integral part of the song structure. Furthermore, I would also add that the symphonic elements fall into the "over the top" category, much like Rhapsody. The guitar work is fast and energetic, yet technically precise at the same time. I particularly enjoy some of the speedy, neoclassical guitar shreds and keyboard textures (Visions era Stratovarius, anyone?) that Epiclore employs throughout the album. 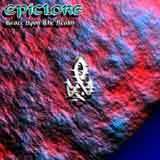 Epiclore features strong musicianship all the way around, especially impressive for such a young band putting together a demo release. Furthermore, the guys possess a certain knack for writing catchy, interesting songs that demand your attention. Anyone can write 5-10 minute songs, but not everyone can write interesting songs of this length. Well, Epiclore demonstrate their strong songwriting skills on this demo which should combine with their technical skills to take them far. My only complaint would be regarding the lead vocals. His delivery does not quite seem to fit the music. While the music is speedy and epic in nature, I find the lead vocalist is too restrained and laid back in his delivery. This style is just fine for the ballad, And Deed Live On. However, I truly think he needs to dial up the energy and push his boundaries a bit more on the rest of the album. All things considered, Grace Upon the Realm is a demo release that should get this band some serious attention from labels out there. As far as musicianship and songwriting skills go, Epiclore are in a very fine starting position. Logic tells us that they will only improve from this point which is extremely encouraging. If they can improve in the vocal department as I mentioned above, this band will have the recipe for success. The good news is that you don't have to take my word for it! The band has made this entire release available for download at this site.